Dropping $3 bln on the headphones maker and streaming service and hiring co-founders Jimmy Iovine and Dr. Dre may reinvigorate the tunes franchise that helped put the iPod creator on top. It also suggests subscription songs – and maybe “smart homes” – are the wave of the future. 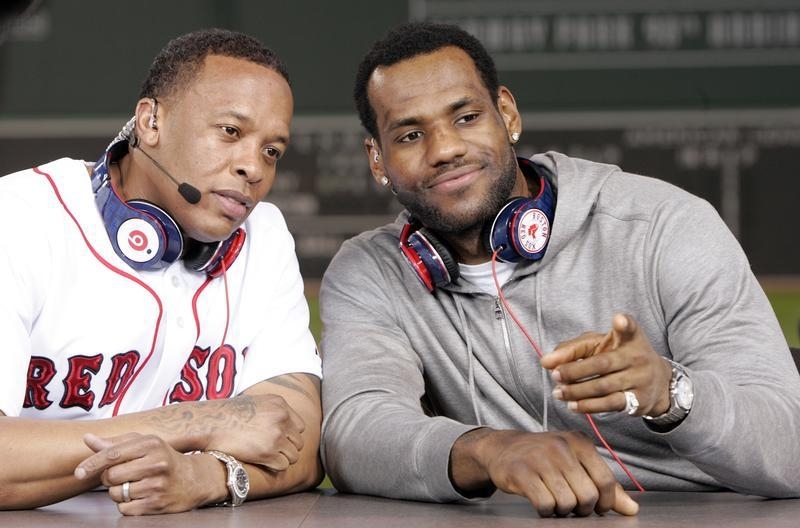 Cleveland Cavaliers LeBron James and recording artist Dr. Dre (L) attend MLB's 2010 season opener to watch the reigning World Series Champions New York Yankees take on the Boston Red Sox in their American League baseball game at Fenway Park in Boston, Massachusetts April 4, 2010. Apple on May 28 announced that it would acquire Beats Music and Beats Electronics, the headphone maker and music streaming service, for a total of $3 billion. Beats’ co-founders, veteran music producer Jonny Iovine and hip-hop mogul Dr. Dre, will join Apple as part of the deal. The purchase had been widely anticipated after Reuters reported the companies were close to agreeing a deal on May 9.